*This post may contain affiliate links. This means we receive a small commission if you choose to purchase through these links, at no extra cost to you. We only recommend companies/products we use and trust. Lauterbrunnen Valley is arguably one of the most beautiful regions in Switzerland. It’s definitely one of our personal favorites. After first visiting it during the spring, Travis and I vowed to come back later in the year to do some hiking and camping in Lauterbrunnen Valley once the weather was better. When a few days of clear blue skies opened for us in May, we loaded up the car with camping gear, food, and Touille – the hardiest little rat terrier in Switzerland – and headed southeast. Our destination? Stechelberg, a small village at the very end of Lauterbrunnen Valley where it disappears into the Alps. We’d been living in Switzerland for 10 months and still hadn’t gone camping. We’d spent that time exploring various areas of the country, but we’re often so close to home after a day of exploring that we opt to head home instead of paying to stay overnight somewhere. It’s hard to “justify” camping at an expensive campground when we’re less than an hour from home. Plus an overnight trip takes more planning, something we prefer not to do. For this trip in particular, though, we were set on camping. When we arrived in the valley, we weren’t sure where we’d end up camping for the night. We typically prefer to avoid campgrounds, but we’ve gotten mixed messages from Swiss natives and expats alike about whether “wild camping” – camping in undesignated areas – is allowed. Some folks have said it’s ok to camp anywhere you like, even on private property, as long as you’re quiet and non-destructive. Others have said it’s never ok except in a campground. I’m guessing the truth is somewhere in the middle, but the uncertainty during this trip to Lauterbrunnen Valley led us to opt for a campground, at least for our first Swiss camping experience. The Swiss Alps are stunning from our campsite in Lauterbrunnen Valley. Right before our trip, we’d received our ACSI Camping Card in the mail. 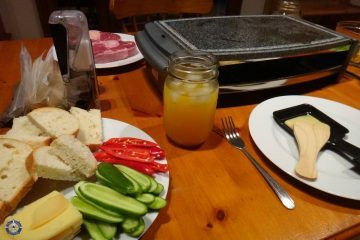 I’d bought it online, and this would be our first time using it. The card is a discount camping card that costs about $20 and can be used at almost 3000 campgrounds across Europe except during the high season, typically July and August. My main concern with the card was that the campgrounds associated with it would be too nice for us since our style is more rustic. But with discounts of up to 50% off and campgrounds that can easily hover around $50 a night here, we thought we’d give it a try. When we arrived in Lauterbrunnen Valley, we headed to one of two campgrounds that accepts the ACSI card – Camping Ruetti (Campsite Rütti in German). It’s located at the far end of the valley in the village of Stechelberg. The tiny hamlet is the gateway to hiking in the Jungfrau UNESCO World Heritage region. The following day we would be doing a strenuous and insanely stunning all-day hike to Obersteinberg within the UNESCO area, so the location for us was ideal. The campground was virtually deserted. Just one couple had staked out a space at the far end of the long, narrow strip of grassy tent spots surrounded by fields of yellow and white flowers. Cows grazed peacefully in the fields, the tinkling of their bells gently echoing off the canyon walls. Alpine cliffs loom behind our car and tent at Camping Ruetti, our home for the night. Since the tiny registration office was closed, we picked out a nice spot with a superb view of Mürrenbach Falls flanked by the smaller Aegertenbach Falls on the right. Pitching our tent in record time, we hastily threw in our sleeping pads and bags. We scoped out the bathrooms, immaculate like the entire campsite, and I was happy to see a row of recycling bins adjacent to the sinks. If you have day old bread, you can drop it in the tub there for them to feed to their farm animals. Even thought it was early evening by then, we were rarin’ to hike. Dog in tow, we set off in search of a short hiking trail to enjoy the last few hours of light in the valley. 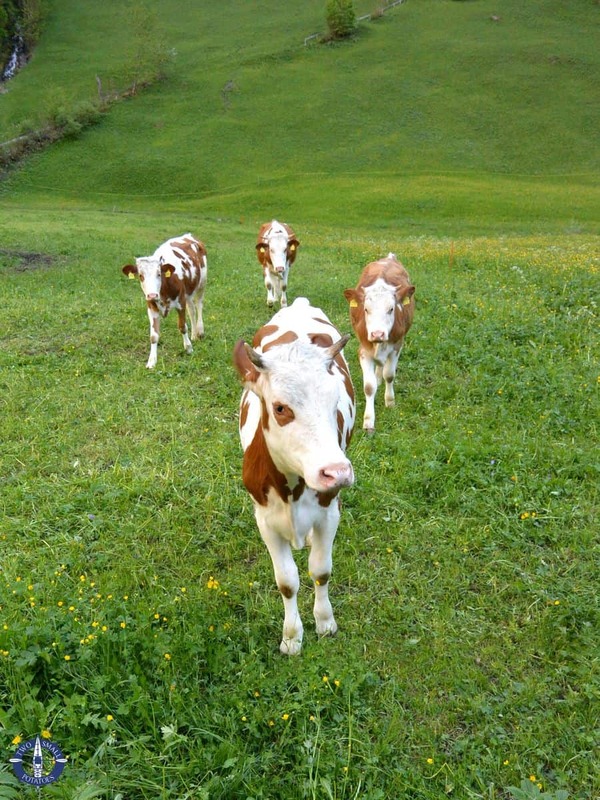 Of course, it’s mandatory to pass adorable cows in order to reach any trail head in Switzerland. Lauterbrunnen Valley is no exception. It’s a Swiss cow round-up. RawwwHIIIIDE! 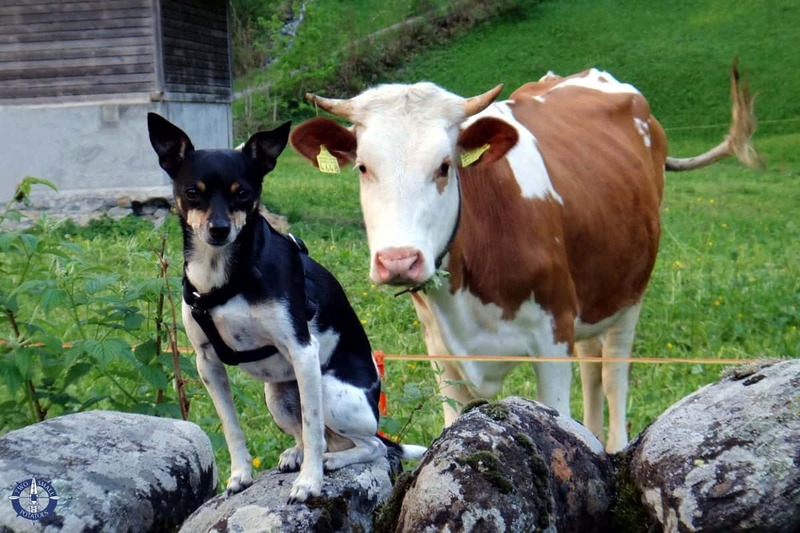 Cows are so friendly in Switzerland, they seem to think they’re dogs. They even tried to play with Touille. Always drawn to water, we crossed over the Weisse Lütschine River to a bridge with a lovely view of Sefinenfall. The path to the right looked inviting, cool in the shade of the trees after a rather warm day. The breeze from the stream refreshed us as we trudged uphill, and the hike into the canyon offered peek-a-boo glimpses of several waterfalls, the creek below, and the little town of Gimmelwald above us. Though not as spectacular as our hike would be the following day, it was a lovely introduction to hiking in the valley. For those who aren’t up to tackling this steep hiking trail, a cable car in the valley offers a quick and scenic ascent to the cliff-top town. Finally driven to turn back by hunger and the growing darkness, we returned down the trail, resting briefly on a bench overlooking the valley spread out below. Back at our campsite, we fell into bed before midnight, excited about our impending adventures the next day. 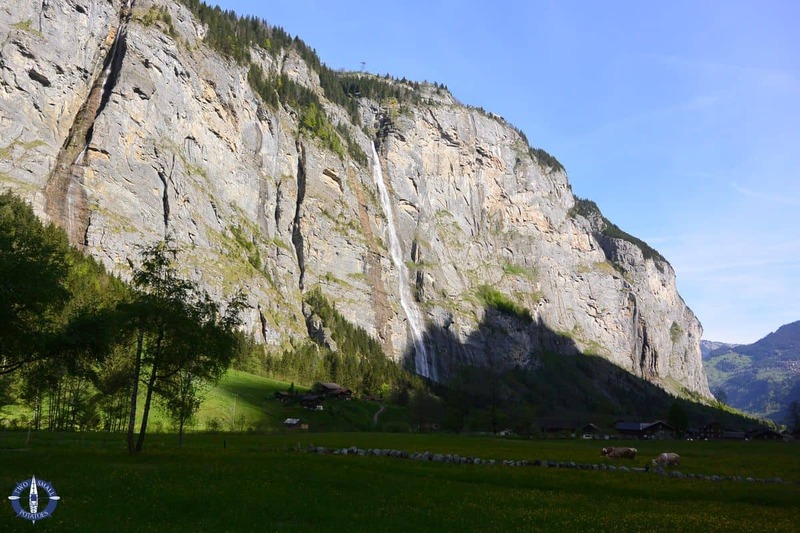 If you’re planning a trip to Lauterbrunnen Valley, you might also like exploring Trümmelbach Falls – roaring glacial melt-water inside the cliffs – and the UNESCO Alps hike to Obersteinberg. For us, full price for one night for 2 adults in a tent spot with a car and a dog would have been 28 chf without our ACSI (European camping discount) card. With our card, we paid 21 chf. If you plan to stay there, make sure to look at their fees online. Charges are itemized, so while the cost may appear minimal initially, the price increases quickly. Camping Ruetti is one of two campgrounds located in the town of Stechelberg, the last town in Lauterbrunnen Valley about 5 km past the town of Lauterbrunnen and Staubbach Falls. The campground offers superb views of Mürrenbach Falls flanked by Aegertenbach Falls and a handful of other smaller waterfalls on both sides of the valley. The campground has restrooms and hot showers (showers cost extra unless you have an ACSI camping card), bins for recycling and a tub for donating your old bread for their livestock, and nice, flat, grassy pitches. Hotels in the area run into the hundreds per night and are often booked solid. Backpacker hostels are available and start at about 40 chf per night. Dogs are welcome on leash; they cost 2.50 chf extra. Hiking to and near Staubbach Falls is closed during winter months due to safety concerns, mostly boulders and debris coming over the falls. This sounds amazing! I am planning a trip there with my partner next year. We live in Colorado and are used to pretty rugged backcountry camping as well…. but love the idea of simply sleeping in a tent in lieu of hotel while traveling. Are there many rental places where we could get a tent/mat/sleeping bag? Any insight would be greatly appreciated!! Thanks!